This past weekend, the team traveled to Penn State to compete at the Nittany Ice Classic at Pegula Arena. After a fun two days of skating and a competition that marked Grace Caldwell’s return after two years to freestyle and Amanda Li and Astoria Song’s collegiate competitive debuts, we placed third after University of Delaware and Boston University and qualified for Nationals. We will be competing at Delaware in the Spring and look forward to our last few weeks of the 2018-2019 season. Thank you to Jacki, Joann, the Friends of Dartmouth Figure Skating and all volunteers and parents that helped us out this year, we couldn’t have done it without you. Here’s to Nationals! This winter we have two competitions and have been pushing hard during practice getting new programs and continuing to run old ones. Over MLK day, skaters took advantage of the three day weekend to skate double practices on Sunday and Monday and took a half-hour power class two days in a row with Jacki. We’re excited for our next competition at Penn State, where some skaters will be debuting new programs. This next competition marks Astoria Song’s ‘22 and Amanda Li’s ‘22 first competition with DFSC. 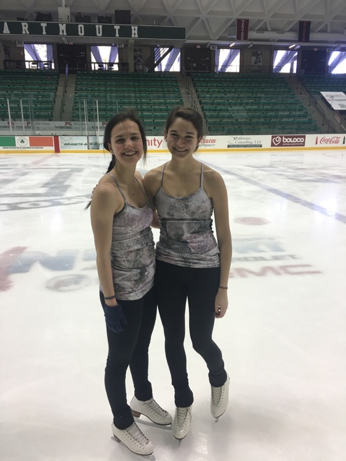 This past weekend, Dartmouth figure skaters traveled to MIT to compete. We had a great showing from our skaters adn placed third with 108 points behind Delaware and Boston University. The competition marked Grace Caldwell ‘19, Honora Verdone ‘20 and Mags Ren ‘19’s first competition of the season. Emma Guo ‘20 and Jenny West ‘20 both traveled to Boston during their off-terms to compete with us. Go team! Check out our instagram for videos and photos from the competition. Competitors Darya Romanova ‘21, Charlotte Chui ‘20, Honora Verdone ‘20 and Sherrina Hwang ‘21 with their first and third place medals! Skaters take advantage of the gap in starts on the Sunday of competition to take a team photo. 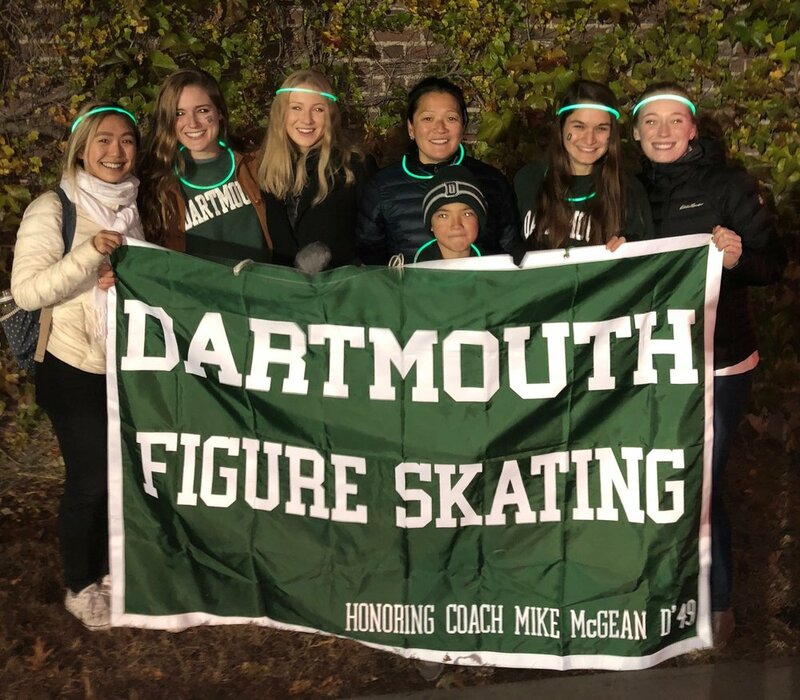 Over homecoming weekend, upperclassmen represented Dartmouth Figure Skating in the pre-bonfire parade and supported the freshman as they ran their lap around the homecoming bonfire. Seniors Spring Yu, Isabelle Blank, Grace Caldwell, Anna Staropoli and Ellen Smalley stand with the DFSC banner and with our coach Jacki Smith and her son Logan before the homecoming parade. DFSC alum Pinar Gürel got married this Fall in Turkey! We wish you all the best Pinar!!! The '20s spent the last couple of months in Hanover for their sophomore summer! Between swimming in the river, trips to Ice Cream Fore-U and Fourth of July festivities, our awesome juniors found time to get together for parents weekend at Morano Gelato and take two off-ice jump classes with Jacki. 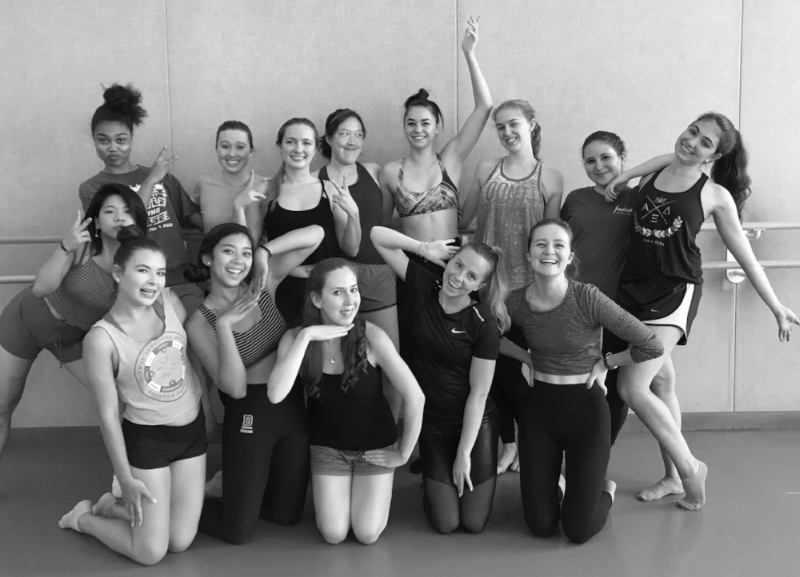 Adventurous DFSC members Jennifer West ('20), Honora Verdone ('20), Emma Guo ('20), Claire Burner ('20) and Elizabeth Nguyen ('20), took their skills off-ice to join the summer dance group Splendaplum (the summer edition of Dartmouth's year-round contemporary dance group Sugarplum). We're sure the addition of DFSC members made the dances that much sweeter! Pictured along with other members of Splendaplum are DFSC members Elizabeth Nguyen (front row, second to left), Jenny West (front row, center), Honora Verdone (back row, second to left), Emma Guo (back row, center left) and Claire Burner (back row, center right). Multitalented Jennifer West ('20) was named the 2018 winner of the Ruth and Loring Dodd Playwriting Competition, Dartmouth’s annual student playwriting competition. She wrote the music, lyrics, and script of her one-act play “First Year,” which was performed at the Hopkins Center on July 27 and 29. Jenny West outside the Hopkins Center on opening night of her play that was performed as a part of the Frost/Dodd Play Festival. We're so proud of you Jenny!! New York had so much to offer! Here's a shot of Alex enjoying Storm King's amazing sculptural installations! 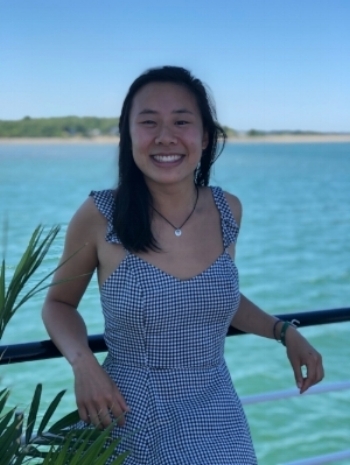 Our resident graphic-design superstar Regina Yan ('19) (of winter carnival poster fame) spent her summer in Boston interning at a tech startup incubator in Boston, and worked as a designer and front-end developer. She learned a lot about how companies develop and how data and analytics can inform design and business decisions. Anna Staropoli ('19) and Isabelle Blank ('19) traded skates for pasta and ice rinks for vineyards. The two spent the summer in Florence writing for an arts and culture magazine. Perks of the job included traveling around Tuscany for press conferences and learning how to better speak Italian. Isabelle and Anna were sad to leave Italy but are excited to return to Thompson to get ready for the upcoming season!! DFSC headed to Nationals in Denver, Colorado three weeks into Spring Term. We enjoyed an amazing four days in high altitude and loved getting the opportunity to skate on Nationals ice! The weekend was a great way to wrap up our season and the memories we made were truly amazing. Check out a video made by Mia '20 of our time in Denver!!! Forget beaches and bathing suits, DFSC enjoyed the first half of spring break Hanover-style with team movie nights, excursions to West Lebanon, and of course, lots of skating in preparation for last weekend's Carnegie Cup. With a week to detox from the term, DFSC flew to Pittsburgh with enough energy to secure a top-three finish. The weekend began Friday with a strong practice session after landing in the Steel City, followed by a team dinner, letting everyone fuel up and get focused for the weekend’s performances. The first day of competition saw a huge turn-out from the Big Green, and not just because it was St. Patrick's Day! Darya Romanova '21 went undefeated, earning gold medals in Preliminary and Juvenile Dance. She later earned her third gold in Pre-Preliminary Freestyle. Our dancers, likewise, made an impressive showing. Every dance start DFSC entered earned points for the team! The day concluded with team maneuvers, where low team placed first and high team fourth. Following Saturday's competition, DFSC enjoyed team bonding in that special way only possible at competition - playing with face masks gifted from secret psychs, watching Vines, and learning that microwavable Skinny Pop does, in fact, exist! The competition ended on Sunday, where Captain Jessie Anderson '18 skated a beautiful senior program to place fourth, Charlotte Kuller '20 earned second in Intermediate Free, and Alex Magnuson '19 won gold in Senior Champ. The University of Delaware won the weekend with 129 points, followed by Boston University with 118 points. February has certainly kept DFSC busy! We began the month with our second qualifying competition at MIT. In Boston, we presented some of our best skates to round off the weekend with a third place finish. We also loved seeing so many alums at the competition. Whether we’re cheering in the stands or catching up in the locker room, it’s incredible to be back with so many of our friends, proving that the DFSC legacy continues long after graduation. DFSC bonds during a late night study session in an MIT hotel room. We had equally great skates during Winter Carnival, kicking off Pond Party by participating in the on-ice parade. Some of our skaters on off terms joined us for the weekend, and many of us also went to Lake Morey, cramming as much skating as possible into two days. Some of use even tried out hockey skates! In addition to skating, we’ve watched many programs together over the past two weeks. From holding each other’s hands each time Mirai launched into her triple axel to embracing our new title of “the harshest sports critics” by the Dartmouth ski team at the adjacent Collis TV screen, we’ve loved sharing the Olympics with one another. For the ladies short, Jacki hosted the team, supplementing the watch party with a homemade pasta dinner and an Olympic-themed cake! Is the Collis TV room the new Thompson Arena? DFSC at one of many watch parties. Next up we are heading to Carnegie Mellon for our third competition. As always, thanks so much for your support. Without our friends, we wouldn’t be able to have these incredible experiences as a team. Though we are only now settling into the academic term, DFSC has spent the last four weeks gearing up for our next qualifying competition. With MIT less than one week away, we are looking to perfect our programs and bring our A-game to Boston. From cheering each other on through each run-through to catching up with skaters who’ve been abroad to sharing the occasional 9 pm dinner after late-night practice sessions, we’ve spent the first half of term together on and off the ice. A perfect match! Jessie Anderson ’18 and Anna Staropoli ’19 share midday ice and a wardrobe at Wednesday’s practice. Artistry on the ice AND on paper – DFCS’s own Regina Yan ’19 is the winning designer of Dartmouth’s 2018 winter carnival poster! We’ve also welcomed a new skater to our family; Whitney Garden ’21 has recently joined the team after a skating hiatus and has been training hard at Thompson Arena. In addition to welcoming our ‘21s, we are looking forward to skating with some familiar faces this competition. Though they are currently enjoying their off-terms, Isabelle Blank ’19 and Honora Verdone ’20 will travel from New York and Wyoming to #skatesparkleshine at MIT! We can’t wait to see them and welcome the rest of our friends to cheer us on at MIT next weekend. If you are unable support us from the stands, check out our social media for results or consider making a donation to the team. We are so grateful for the support of our friends and are so excited to keep you updated as the season progresses. Hello! We are so excited to start the 2017-2018 season. It’s been wonderful to both see familiar faces back on campus and also welcome our three newest members: Michaela, Darya, and Sherrina. But, we can’t help but miss our ’17s. It was great seeing you and others at alumni skate, and we hope you all can visit this year! In addition to working hard on the ice and setting weekly goals with our training buddies, we have also been having a lot of fun getting to know each other off the ice. We held our annual homecoming team dinner, complete with skating trivia, pizza, and amazing homemade baked goods, before participating in the parade. In addition, inspired by the beautiful fall weather we went apple picking together! We’re looking forward to hitting the ice for our first competition of the season at NYU. We can’t wait to start competing with our goal in mind of qualifying for Nationals! Most importantly, we want to take the time to say “thank you” to the Friends of Dartmouth Figure Skating for all of your support. Our team is strengthened by our shared passion for skating, love of Dartmouth, and respect and friendship for each other. Some of our best memories with the team are formed through traveling and competing together. Without the continued love and support of our Friends, our season would not be possible; we are so incredibly grateful! We are looking forward to a great year, and hope you are too! Please continue to stay in touch; we will be live tweeting our competitions and posting to our Instagram to keep you up-to-date on DFSC's results and other activities. Go Big Green! With our competitive season just around the corner, it makes me stop and reflect on last season. It was a whirlwind of a season with four competitions, finals and spring break sandwiched between February 4th and April 2nd. It definitely tested us as students, athletes, and staff. But through it all – great skates, points scored, exciting team maneuvers, cheering from the stands and the never-to-be-forgotten 23 hour delay home from VA -- we have wonderful shared memories. As we head into this season and the new changes coming to Intercollegiate team skating, I realize how far this sport has come. From the need to add more time to each competition, to lowering the total number of starts submitted by a team, to having the top four teams of each section qualify for Nationals, it shows the growth of talented student athletes across the country. As we welcome the new 21s, Michaela, Sherrina, and Darya, to our family, it has been great having the 18s, 19s, and 20s back on the ice together and sharing traditions like meals together, training buddies, and Come skate with us and SCAD. I look forward to the new year and seeing many more memories created with the team. I want to thank all the parents, friends, and alums who have supported us over the years. Without you we could not continue to grow and share this wonderful opportunity with skaters in the Dartmouth community. With the growing sport we have a lot of work ahead of us but cannot wait to take on the new challenges the season has in store. DFSC had a fantastic homecoming! On Homecoming Friday, we enjoyed a team dinner before the bonfire, participated in the Homecoming parade, and cheered on our 21's as they ran their laps! On Saturday, it was great to see our alumni for some refreshments and skate with them afterwards on their return to Thompson ice. DFSC Homecoming Friday, in the hours before the bonfire. Practice sessions are full of energy as we are now focusing on preparing for our fall exhibition on October 30 and the NYU Violet Ice Classic in Monsey, NY on November 10-12. We hope you’ll have the opportunity to see us compete! We’d love to have you skate with our team at Thompson Arena, 1:15-2:45pm. Afterwards, there will be a get together in Smoyer Lounge with light refreshments. Continuing with tradition, we are looking forward to participating in the Homecoming Parade and cheering on our first years as they run around the bonfire! Skating with the Skating Club at Dartmouth is always a fun event we look forward too. It is a great opportunity to connect with skaters in the Upper Valley community. The Fall Exhibition is an exciting chance to show off our skills in front of our peers and practice our programs before competition. We also enjoy putting together a whole-team group number that concludes the show. Our first competition this season is hosted by New York University in Monsey, NY. We are already working hard at practices, eager to have a strong start to the season. We can’t wait to begin another season with the hopes of qualifying for Nationals again. Catch up with Dartmouth Figure skating's summer! I spent the summer in Seattle, WA for a software engineering internship at Qualtrics (a survey and data analytics company). I've never lived on the West Coast before, and the Pacific NW turned out to be an awesome place to be in the summer! I spent my weekends hiking, camping, biking, and exploring the city; almost every day was dry, beautiful, and full of sunshine. All in all an incredible experience. I'm looking forward to my final year of college with a mixture of excitement and nostalgia. The skating team has been central to my life at Dartmouth, and I'm excited to help make this season fun, successful, and memorable! This summer I interned at Figure Skating in Harlem, which is a nonprofit organization that uses the sport of figure skating to engage underserved girls in education and fitness programs that promote academic success and physical health. Figure Skating in Harlem’s mission is to help the girls they work with grow in “confidence, leadership, and academic achievement.” This mission is fulfilled with their after-school program during the school year and in the summer a six-week camp for girls in first through eighth grade and biweekly workshops and ice time for the high school girls. As an intern, I was the math coordinator, worked with the education data analyst to collect data on the girls’ academics and experiences in the program, and was a figure skating instructor for thirteen third and fourth graders. It was exciting to work with Figure Skating in Harlem because I was able to use the girls’ and my shared passion for skating to connect with the girls and help them excel in their academics. This past summer, I had a really interesting clinical internship with the trauma team at the Robert Wood Johnson Medical School in New Jersey. I also attended plenty of concerts, snorkeled down in the Florida Keys, and had an awesome time as a DOC Trip Leader for a white water kayaking trip for the incoming ‘21s. Last year was my first year on the Dartmouth Figure Skating Team. The team provided an instant group of friends who share my love of skating and a way for me to continue the sport. There is a real sense of camaraderie and support among the team members and I am incredibly excited to be the programming co-chair this year! The DFSC 19s enjoyed an incredible Dartmouth Sophomore Summer! In addition to taking classes, the DFSC 19s spent the summer making countless Ice Cream 4 U trips, relaxing next to the river, and enjoying each other's company after spring terms spent abroad! 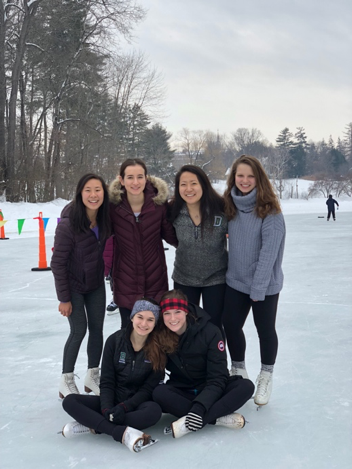 With Thompson Arena closed, DFSC members Kate Serota (Grad), Isabelle Blank '19, Anna Staropoli '19, Regina Yan '19, and Grace Caldwell '19, swapped out their figure skates for roller skates (See Below). With a bevy of Dartmouth Figure Skaters in attendance, Kate Schmidt '09 married Sam McPherson on June 24, 2017 at Pippin Hill Farm and Vineyards in Virginia.